A few weeks ago I cleaned out and organized my closet. I probably do this about once or twice a year and every time I come to the same conclusion: I have too many clothes! Purging unwanted items from my closet and organizing the ones I want to keep does make me realize that I should "shop my closet" more and make use of the many fabulous things I already own instead of buying new things. So, for this outfit, I reached way back and found my J. Crew silk "Punk Floral" blouse from about five years ago. This is one of my favorite J. Crew prints for obvious reasons. If you missed out on it, there's actually a popover blouse in the same exact print from Nordstrom! It's also a part of their Anniversary Sale that ends today, so if you want it, now is your chance to snag it for a good price! I paired my "old school" "Punk Floral" blouse with these tie waist gingham shorts from Target. I have worn these shorts more than just about any other pair this summer, so they were definitely worth the $15 I spent on them in the spring! 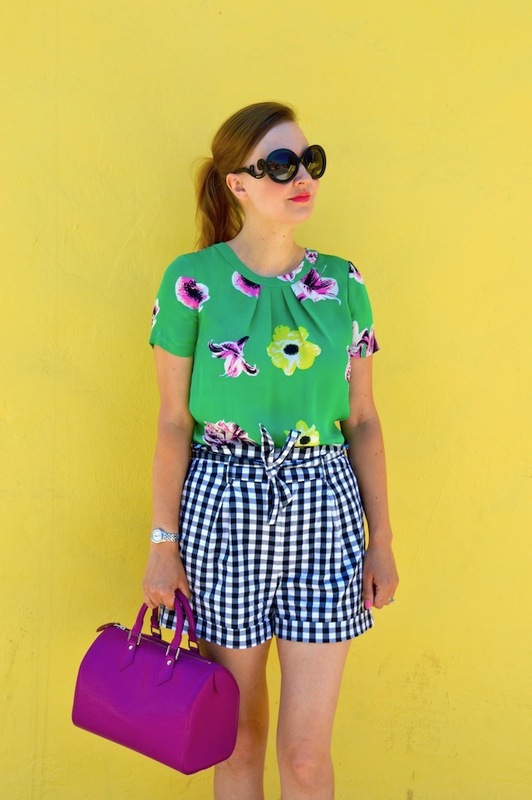 While these particular shorts are unfortunately no longer available, I am linking to some similar gingham shorts below. Trust me when I say that these shorts go with just about everything and make anything, even a simple tee, look adorable! I have this blouse and love it! I never part with it during purges even when I haven't worn it much. I've been wearing it again this year, and recently wore my gingham shoes with it. Love it with your shorts. This is such a darling outfit! I love all of the components and how you've mixed everything. I'm especially enjoying your pink/purple handbag.